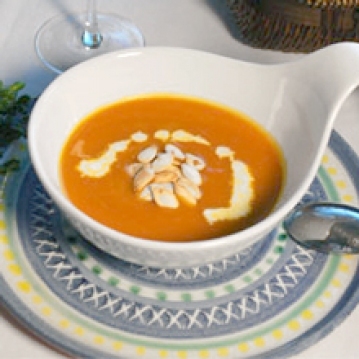 This delicious butternut bisque has a touch of smoked ham hock. Its exquisite consistency makes a perfect second course, after a light salad, followed by a simple dessert. 1. Slice the butternut lengthwise and keep the seeds for later usage. Place the sliced butternut on a baking sheet and season with salt, black pepper and olive oil. Place in the oven for 30 minutes, or until the butternut is tender. 2. In a pan, at medium heat, melt the butter and add a few drops of olive oil. Sautee the shallots, garlic, and carrots until they are golden and soft. 3. Peel the butternut and add it to the pan with the other vegetables; let it rest and absorb the flavors. Season with salt, black pepper, allspice, nutmeg, and brown sugar. 4. Place everything in a blender with a bit of the chicken stock (hold the lid of the blender as it is on, otherwise it will explode everywhere. Be careful). Return the processed mixture to the pan. 5. Make several cuts on the hock so as to release the flavor, and add it to the pan. 6. Add the herb sachet to the pan with a string, leaving it out of the pan so as to not forget to retrieve it later. 7. Add the chicken stock and cook for about 20 minutes. 8. Take out the sachet and the ham hock. Lower the heat to a simmer. 9. Add the heavy cream and mix, checking the consistency and flavor; Cook for a few minutes. 10. (Optional). Toast the butternut seeds in an oven at 350 F. Watch the seeds as they can burn easily. Serve the bisque in a bowl and decorate it with the seeds and some heavy cream. In case you do not have shallots, replace with onions.